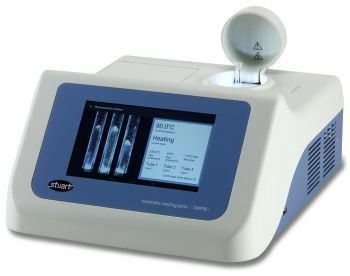 The new Stuart SMP50 Automatic Melting Point Apparatus replaces the SMP40 model, which is now obsolete and employs the latest digital camera technology to produce a high resolution video of the sample melt, this allows the intelligent melt algorithm to identify the smallest of changes within the sample, accurately and reliably determining the melting point of up to three samples simultaneously. The SMP50 has a custom designed user interface based on an established Android platform for intuitive setup and navigation. The familiar elements of an Android operating system help the user to feel comfortable, with everything where you would logically expect it. All operation is via the 7" high definition colour touchscreen. Once programmed, users can leave the SMP50 to complete the melt analysis independently, alternatively the melt can also be observed on the screen live or post melt. During post melt review additional measurement tags can be added if required, such as meniscus point or the automatically obtained result can be overwritten. A generous 8GB on board storage is included, which should comfortably hold approximately 300 melts files including videos. Results can also be transferred via USB stick on to PC for a more permanent long term record. All video files include a temperature stamp, so whatever device you view them on you can confirm the automatically obtained result. The SMP50 features a useful storage drawer to house all standard capillary tubes. The drawer also contains a small glass cutter that can be used to accurately cut sample tubes in half, for those users who prefer not to use whole tubes. Not only will the glass cutter always get the cut in the centre of the tube, but it will also reliably give a clean cut making sample loading cleaner and safer. While all measurement files can be easily transferred onto a PC from the SMP50 there is also an accessory printer for direct printing of the results directly from the unit. All units are factory supplied with a calibration certificate showing individual serial number for traceability. The SMP50 also conforms to Pharmacopeia and GLP.